A new slideshow image of Samsung’s upcoming Galaxy S8 feature leaked online. This new feature, which is very much like Microsoft Continuum, will bring desktop experience on Galaxy S8. 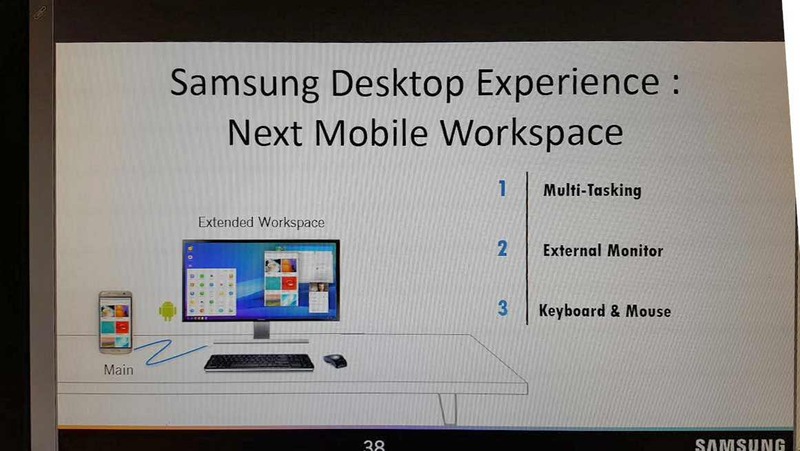 Users will able to connect the phone to monitor and use windowed apps on a big screen using a keyboard and mouse. This new feature will turn your phone into a big-screen projector and a big-time productivity tool. You can use your apps and see your content on a larger screen. However, Samsung would not be the first Android company to try this feature with Android. Previously, Motorola introduced OneCompute in June 2016. Problem is that Android suffer from a shortage of applications designed to be used with a mouse and keyboard and not offer as good an experience as Microsoft’s Continuum does with Windows 10 Mobile phones.